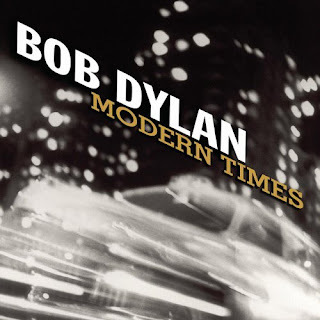 Recorded over a few weeks in early 2006, Bob Dylan's Modern Times stands as a worthy follow up to "Love and Theft" from 2001, building and expanding upon the themes of the latter album. Replete with historical references and nods to ancient poets, Dylan also inserted commentary on the 21st Century and where it's going. As the title suggests, Dylan took inspiration from Charlie Chaplin's 1936 film Modern Times, Dylan despairs and revels at life in the 21st Century. "Thunder on the Mountain" gets things off to a rousing start, featuring a retro intro that invokes the birth of rock and roll. The first verse heralds the coming of end times, then the second pays tribute Alicia Keys. The final lyrics may be a direct reference to Chaplin's 1918 short A Dog's Life. The attitude, sound, and imagery of "Thunder on the Mountain" suggest an alternate way of looking at the modern world, one for staying sane. "Spirit in the Water" is an epic love ballad. An epic tale of unrequited love that's been going on for centuries that's much akin to Dante's Beatrice. Each verse packs a punch that alternates between humor, violence, desire, hope, loss, and melancholia. "Rollin and Tumblin" returns to the blues, a tribute to Muddy Waters. "Someday Baby" continues along in the same vein of classic blues. "When the Deal Goes Down" and "Beyond the Horizon" are theological laments on mortality, produced in the style of 1930s Cole Porter, foreshadowing Dylan's work in the next decade. "Workingman's Blues #2" encapsulates the class struggle, a preoccupation of Dylan's going back the early Woody Guthrie influenced material.The first verse proclaims "the buying power of the proletariat gone down" refers back to old left 1930s politics. Along with "Thunder on the Mountain" there are numerous references to the tragicomic adventures of Chaplin. I always find "Nettie Moore" to be the most impenetrable song on Modern Times, perhaps due to Dylan's repetitive delivery. The imagery is bleak, full of regret, betrayal, and tragedy. "The Levee's Gonna Break" was recorded with Hurricane Katrina fresh on everyone's mind, another track about a flood and tragedy on a biblical scale in a call back to "High Water" on "Love and Theft", here the tone is less defiant and more resigned to fate. The last lyric, "some people are still sleeping; some people are wide awake" reads like a warning. "Ain't Talkin" revels in apocalyptic imagery, seemingly a continuation of the motif set up in "Thunder on the Mountain." A spiritual warrior walks through a desolate landscape and reflects on many things and speaking of "practicing a faith long abandoned." The past was glorious, the present is depressing, and the future lays in the balance. Although Modern Times lacks the electric swagger of "Love and Theft" and borders on being derivative at times, it contains some of Dylan's best work . "Thunder on the Mountain," "Spirit on the Water," and "Workingman's Blues #2" are all diamonds in his catalog. All ten songs would sustain Dylan's live concerts in the years to come, an impressive feat in itself. The old world perspective, feelings of loss and faint hope, and a sense of the mythical American landscape all define Modern Times. Well written reviews. Too many Dylan reviews are "bloviating" and self absorbed, "seeing" in them what does not exist. I enjoy this writer's sober and mature view. "Working Man Blues #2" is one of Dylan's most touching post 1997 writing. The author's last sentence is a good summation of what I think is one of Dylan's best albums. I assume you know Nettie Moore is based on a Civil War era song about a slave's lover being sold away. Sad. The original sheet music is somewhere on the internet. I don't agree with everything said but i do agree with most of the points made..its 3am i need some sleep i live in Australia...in 67 days Bob Dylan starts his 7 Cities 2018 Australian Tour in Perth on August 8th. Thanks for reading! Enjoy the shows! A rare A+ from Christgau, always the melodrama between Dylan and the first generation rock critics.